The Continuous Deflective Separation (CDS) technology was developed in Australia. The non-blocking screening technology has been independently validated by world-class research organisations - CSIRO (Commonwealth Scientific & Industrial Research Organisation), CRCCH (Co-operative Research Centre for Catchment Hydrology) & UCLA (University of California, Los Angeles). 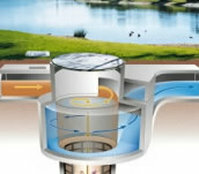 Capturing more than 95% of solid pollutants Rapid Installation: Comes in self contained manhole that has BBA approval. Just connect inlet and outlet. 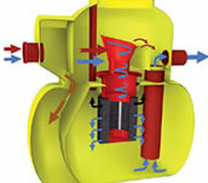 Unique design takes advantage of indirect filtration and properly proportioned hydraulic forces that virtually makes the unit unblockable. The unit has no moving parts and is fabricated of durable materials. ​The technology remains highly effective across a broad spectrum of flow ranges. GET IN TOUCH WITH OUR surfsep SALES TEAM NOW!